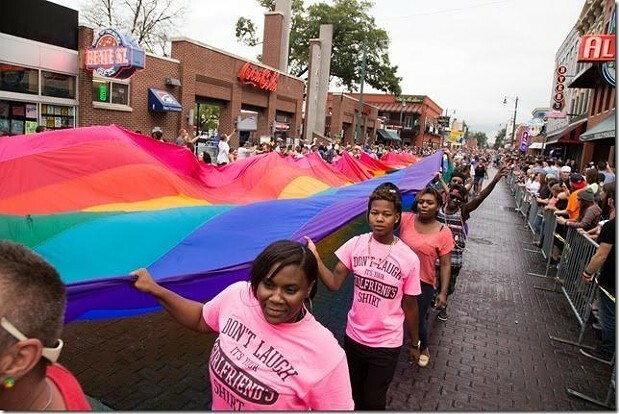 Thirteen years running, Mid-South Pride returns this weekend with an extended three-day celebration and a new name: Memphis Pride Festival. Sure, you could spend your weekend elsewhere, but why would you? Festivities kick off at 7 p.m. Friday with a concert hosted by local queen Freak Nasty at Handy Park. Tori WhoDat, DJ Spaceage, and Seeing Red will perform. Saturday's Pride Festival, with activities for kids, a VIP area, work from various artists, and free HIV testing, lasts from 10 a.m. to 5 p.m. The Pride Parade begins at 1 p.m. and a wave of marchers will take Beale Street's two-mile stretch. Cap your weekend with the Pride Brunch Crawl, which starts at 1 p.m. at Celtic Crossing and will move to other Cooper-Young restaurants. Mid-South Pride Festival attracts more than 9,000 attendees each year. 2015's theme, "Love equals love,"
followed the Supreme Court's 5-to-4 ruling in June that made marriage equality law of the land. This year, despite Tennessee's attempted anti-transgender bathroom bill, Memphis Pride Festival continues to celebrate progress made in support of the lesbian, gay, bisexual, and transgender community.